The data collected through the ambient water monitoring networks, programs and projects, conducted by the Division of Water Monitoring & Standards (DWM&S), resides in a variety of locations including both national and DEP databases as well as on various DWM&S webpages. Click on any of the bars below to access the data of interest. 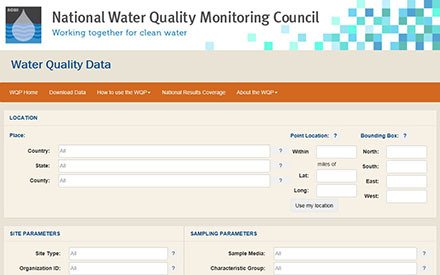 The National Water Quality Portal is a cooperative service sponsored by the National Water Quality Monitoring Council, the US Environmental Protection Agency (EPA) and the US Geological Survey (USGS). It serves data collected by over 400 state, federal, tribal and local agencies. Data is acquired from EPA’s STORET data warehouse, USGS’ NWIS database and the USDA ARS STEWARDS database system. DWM&S’ freshwater physical/chemical data (rivers, streams and lakes) and much of its marine water monitoring data(beach monitoring, shellfish sanitation, chemical water quality and phytoplankton) are available from this portal. NWIS (National Water Information System) is the USGS repository for data on surface water flow and levels in streams and lakes, ground water levels in wells, chemical and physical data for streams/lakes/springs, and water use information. 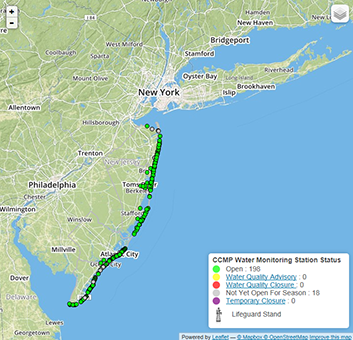 Data from NJ’s Ambient Stream Monitoring Network (a cooperative network with the USGS NJ Water Science Center) can be found here as well as via the National Water Quality Portal described above. Data for all of the freshwater monitoring activities – chemical, physical and biological – can be found on the Bureau of Freshwater & Biological Monitoring’s webpages. Also available on those pages are sediment toxicity data. Data for the marine/estuarine monitoring activities – shellfish sanitation, chemical coastal water quality, phytoplankton, remote sensing for chlorophyll a - can also be accessed from the Bureau of Marine Water Monitoring’s webpages. Beach water quality data can be accessed from the DWM&S homepage. DWM&S performs monitoring in both rivers and streams as well as marine and estuarine waters using both sondes and buoys. Click the image below to access both current as well as historic location data. With NJ-GeoWeb users can view and query the best of the NJDEP’s Geographic Information System (GIS) data. 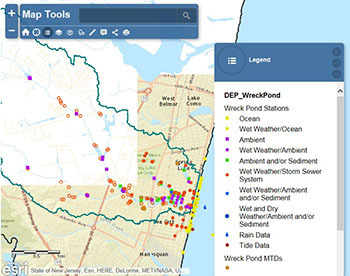 NJ-GeoWeb users can access current water quality and environmental data related to selected features appearing on the map. Users can search for data by county/municipality or watershed/subwatershed and then see chemical, biological or habitat results in tables that can be copied and pasted into desktop software programs.